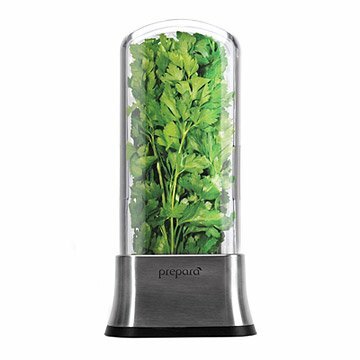 Keep herbs and asparagus fresh with this fridge-friendly produce keeper. For anyone who's been to one too many funerals for expensive herbs, help has arrived. Made to fit on your fridge door, this design is a space-saving and money-saving solution to wilted herbs and wasted produce. Rinse produce in the removable stainless steel basket, place it in the keeper, and fill the water well in the base to keep your green goods happy in the refrigerator for up to three weeks. 100% BPA free and top rack dishwasher safe. Made in China. Louise was on a mission to make her best Tom Kha soup yet, and enlisted the Stainless Steel Produce Keeper for assistance. See how her soup turned out on the blog. This was a real saver for a vegetarian family. They eat lots of salads and cook with herbs. They found this to be wonderful for buying in bulk and using fresh herbs over a longer time.it was made very well.